How many of you buy your mom flowers for Mother's Day? 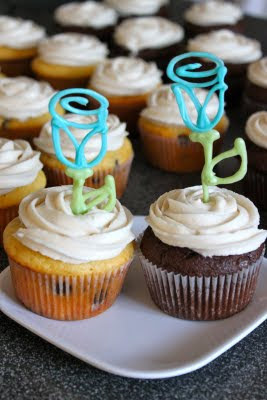 I know in the past I have sent flowers, but you know what is better than flowers...cupcakes with edible roses. What you see pictured here are Vanilla Chocolate Chip and Chocolate Chocolate Chip Cupcakes topped with my favorite Vanilla Frosting and an edible chocolate rose. 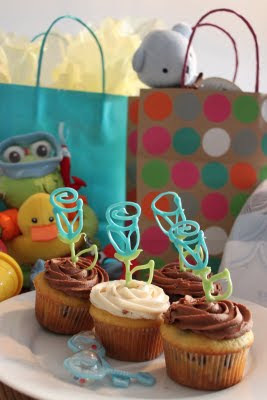 I actually made these cupcakes for a baby shower, hence the blue roses, but I think they would be adorable in assorted colors for mom. What mom doesn't want a dozen edible roses? To make the chocolate roses I piped melted chocolate (using a plastic baggie with the tip cut off) onto wax paper. I drew a template on a piece of paper and then placed the wax paper over it to pipe the roses. I used a toothpick to pre-poke holes in the top of the cupcake to make sure the stem did not break when I inserted the roses. I think they turned out perfectly. See the recipe for Chocolate Chocolate Chip Cupcakes here. In a large bowl, mix together the cake and pudding mix, sour cream, oil, vanilla extract, eggs, and water. Stir in the chocolate chips and pour batter into 24 lined muffin cups.